Combine all the marinade ingredients together. Place steak into a large shallow bowl and pour half the marinade over it, massaging into the steak lightly and leave to marinate at room temperature while prepping the other salad ingredients. Keep the other half of the marinade aside for the dressing. Heat a large non stick frying pan with a little oil and sauté the mushrooms for no more than 5 minutes. Set aside. When all the salad goodies are ready, heat the frying pan again and brown the steak on both sides, then turn the heat down to a moderate temperature and cook for a further +- 5 minutes per side for medium rare. Remove from the pan, cover with foil and allow to rest for 10 minutes before slicing. In the same pan, sauté the Asian greens until slightly wilted. 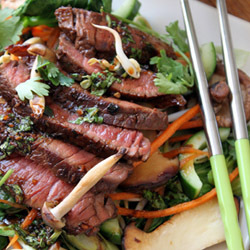 Arrange the wilted greens, sautéed mushrooms and remaining salad ingredients onto a serving platter, top with sliced steak and drizzle with set aside dressing. Reprinted with permission of Bits of Carey. To see more recipes, click here.